As autumn lands with a bump, we are beginning our plans for our next visit to The Gambia, in January. But first, an update on recent Sohm-related activities. On 15 October our second container of materials leaves the UK for Banjul - and a big thank you to our friends at Football Gambia for making this happen. By the time it leaves, we will have sent over 20 x 50 litre boxes of generous donations this year, which we will pick up, early in January, and take to Sohm, for distribution. A couple hundred school science textbooks and an extensive collection of school science equipment, generously given by Auchmuty High School, in Glenrothes, Fife - as it has become surplus to requirements, following their move to new buildings. The school also gave us a much-needed PC printer. Four more laptops, thanks to donations by relatives: Owen, Rachel and Nick, and former colleague, Annette. In addition, we've bought - from an extremely competitive supplier - new batteries for each of the half dozen laptops we've already sent to Sohm - to extend their useful lives. Over 130 PC memory sticks, which our good friend Maria has hoovered up from her office, and wiped clean. It will mean that all of Sohm's ICT students will be able to store all of their own work, in one place - essential in a non-networked environment. A large selection of appropriate children's clothes, for pupils at the schools, following a request from some of the women in the village. Purchased 10 litres of blackboard paint and brushes for its application. This is a key step in improving the predominant 'talk and chalk' delivery of lessons in the schools. Bought external hard drive capacity to help with school ICT capacity and teaching delivery. So, its all stations go! Even after the purchasing, packaging and delivery costs, we should be able to take considerably in excess of £2,000 to Sohm next January, to spend locally, in helping achieve the goals of the charity. We'll keep you updated on progress on that front, once it has happened. We continue to be grateful to a whole range of people - too many to mention, individually - for their generosity in supporting Sohm's schools. 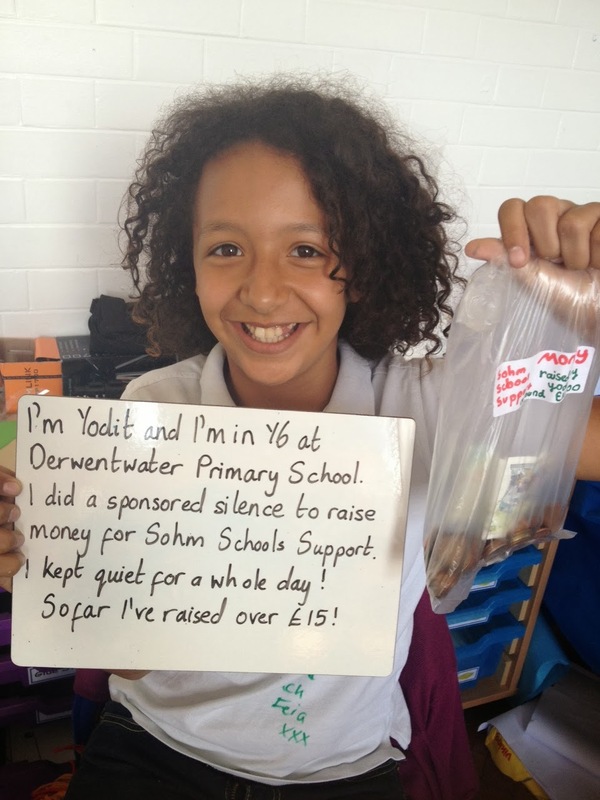 But, a special word of thanks must go to former Derwentwater pupil, Yodit, who we featured on this site in July. We then celebrated the fact that she raised £15 for Sohm, via a sponsored silence in her last day as a primary school pupil. Yodit - an inspiration to us all! She has followed this kind gesture by undertaking even more fund-raising for her former school's twin school, in The Gambia. She has, in total, given this charity £30, which with Gift Aid amounts to almost £40. To put this into context: we will be able to use it to purchase enough English language textbooks for a whole class to benefit. By careful use, this will mean that 100 pupils will benefit next year.